Knee bursitis is often referred to as ‘housemaid’s knee’ as it commonly occurs when individuals spend long periods kneeling. But knee bursitis can be caused by any repetitive pressure on the knee and is common in athletes or people whose job involves repetitive motion. Even my early morning run to the bus stop when late for work could eventually lead to knee bursitis. Let’s look at what knee bursitis is, before checking out some top-selling products that can help you with the treatment of this painful and mobility reducing knee pain. Hot and cold therapy knee support for treatment of swollen or inflamed joints. Adjustable straps for custom compression and most comfortable fit. Flexible neoprene allows for movement and can be worn under clothes. Large 11 x 14 inches flexible gel ice pack. Ideal for nerve pain and bursitis. Ice pack stays cold up to 30 minutes—soft fabric cover protects the skin. 100 percent memory foam pillow with no additives. Ergonomic curved design to support your knees and keep legs, hips and spine in alignment. Added hook-and-loop strap to keep pillow in place as you sleep. Knitted knee compression sleeve using a blend of spandex and geranium/bamboo/charcoal fabric. Choice of five sizes from M (12 to 14 inches) to XXL (18 to 20 inches)—simply measure circumference of thigh about 2 inches above the knee. Perfect for knee swelling such as bursitis or post-surgery recovery. The highest potency available turmeric capsules enhanced with bioperine. All natural, non-GMO, gluten and allergen free—plant based capsules suitable for vegans. 100 percent satisfaction guarantee—no questions asked money back if you don’t feel healthier and stronger. Knee bursitis occurs when one or more bursa become damaged or inflamed. When there’s too much repetitive friction or pressure on the knee, the bursa will become irritated and cause pain. Bursa are tiny, fluid-filled sacs found all over the body, sitting between muscles and bones, almost like ball bearings. They cushion the joints during movement and relieve the impact on pressure points in your knee joint. Knee bursa aid with your movement as you walk, run, jump or even cross your legs. The following short YouTube video looks at the anatomy of the knee bursae in more detail. There are up to 11 bursa in the knee, but knee bursitis most commonly occurs over the kneecap or on the inner side of your knee. Bursitis comes from one of bursa in the knee becoming irritated and producing more fluid than usual. The extra fluid will cause the bursa to become inflamed and swell up. The most obvious symptoms, as anybody who has ever suffered from bursitis will tell you, are the localized pain and tenderness. A noticeable swelling in the knee can often be felt like a squashy lump where the bursa has swollen. You may experience a red or warmth over the knee, especially if the bursa has become infected. Symptoms vary from each individual, but most will find their mobility is reduced with a stiffness to the knee. You may have trouble supporting your bodyweight, and there’ll be pain even when resting which will often increase during movement. Knee bursitis swelling only occurs within the bursa, not your actual knee joint. There’s a tendency to call any swelling of the knee joint water on the knee. There’s an important difference with fluid in the knee joint often being blood, indicative of a more serious condition. It’s important before starting your treatment to identify whether your knee soreness or swelling is bursitis. A visit to a medical professional will give a proper diagnosis. An X-ray or MRI scan can recognise other conditions such as a fracture, arthritis or bone position problems. A manual examination will check for any warmth, swelling and your range of motion besides checking the relative condition of each knee. Fluid samples are often taken by draining the bursa using a needle. This will lessen the pain as the pressure reduces and the fluid can be tested for any infections. Once diagnosed, the best treatment for knee bursitis rarely involves surgery. A combination of at-home treatments and anti-inflammatory medications will aim to relieve the pain of bursitis. Bursitis knee treatment can vary for each individual according to the severity of the injury and other medical factors. An infected knee bursitis will require different treatment which a doctor will advise on. Medical methods for reduction of the pain from knee bursitis can include aspiration where fluid is drained from the bursa with a needle. This reduces the swelling, relieves pressure and can be a chance to run further tests on the fluid. Anti-inflammatories and pain relievers may also be administered to improve mobility and reduce your discomfort. In extreme cases, corticosteroid injections are used to reduce the inflammation. Over-the-counter NSAIDs, like ibuprofen will help decrease swelling, pain and fever with antibiotics also used to fight infection caused by bacteria. In more stubborn cases, a doctor may recommend surgical removal of the affected bursa. Surgery comes with the risks of infection, persistent instability and pain with difficulty returning to previous levels of mobility. Fortunately more than 90 percent of patients who undergo surgery for knee bursitis and follow a rehabilitation program suffer no complications. Resting your knee as much as possible will help to decrease the pain and swelling. As the pain reduces, slowly start to do more each day. Rest will allow the swelling to go down and prevent any future complications as your knee heals. Using a good knee brace or sleeve can help reduce the swelling and add comfort to negate some of the pain in your knee. The bigger and more bulky knee braces are not needed for knee bursitis, rather choose a compression knee brace or sleeve for bursitis to help reduce the swelling of the bursa. Elevating your knee above the level of your heart will also help to decrease the swelling and pain of knee bursitis. Using a pillow or blankets to prop your leg up as you lie in bed will help ease the pain as you sleep. As the pain decreases, a doctor may recommend you visit a physical therapist for rehabilitation and to prevent the recurrence of bursitis. A therapist will teach you exercises to improve your range of motion and increase knee strength. Many of these exercises can be performed unassisted at home or in the gym as shown in this YouTube video. Exercise will also help you prevent knee bursitis. Stretching as you warm up and cool down when exercising will help to loosen your muscles and decrease the stress on your knees. Using knee pads if kneeling on a harder surface or playing sports can also protect your knees. Changing your diet can be effective in reducing and preventing the swelling associated with bursitis. Many foods contain vitamins and enzymes which help to reduce the inflammation and pain of knee bursitis. Pineapple is not only a delicious fruit, but has a high content of bromelain, an enzyme which is effective in reducing the swelling caused by bursitis. Vitamin C found in orange juice is essential for the repair of wear and tear of cells in your body. Anti-inflammatory properties of vitamin C will help to reduce the swelling and tenderness of knee bursitis. Taking 2 teaspoons of fish oil regularly will dissolve the crystals in the bursae while preventing new ones from developing. Omega-3 fatty acids will reduce inflammation and keep tissues and cells strong and healthy. Turmeric can also be a useful spice in the fight against bursitis. Curcumin, the active ingredient of turmeric is often used to treat many chronic diseases due to its anti-inflammatory properties. Curcumin is also very effective as a painkiller with studies showing it to be more effective than diclofenac in patients with arthritis, another joint condition which may contribute to bursitis. Although we’ve looked at many different treatment plans for knee bursitis, you should always consult with a doctor who can quickly diagnose your condition. A doctor or physical therapist will be able to recommend the best treatment for knee bursitis which is most suitable for your needs. 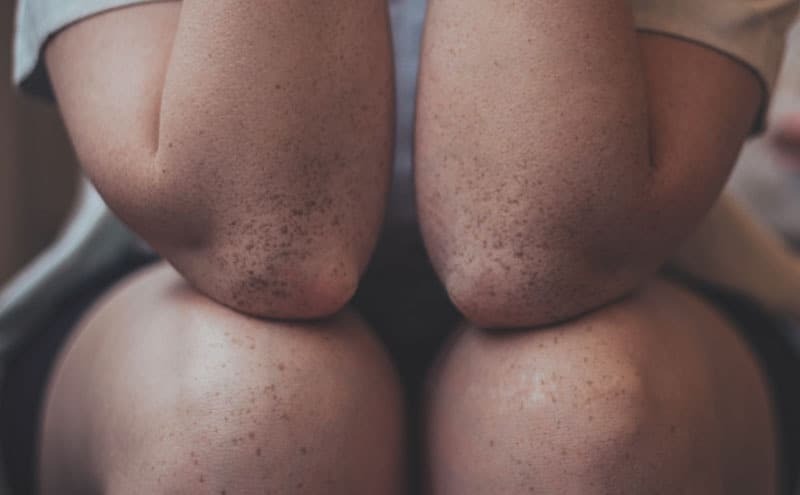 We’ve looked at some top-selling products which claim to be the best treatment for knee bursitis, to bring you in our opinion, the top five ways to ease that pain. Lying down or sleeping will be uncomfortable when suffering from an inflamed knee bursa. Using a pillow or wedge will keep the knee elevated to reduce the inflammation and pain. This 100 percent memory foam pillow has been ergonomically designed to support and align your knees as you sleep. 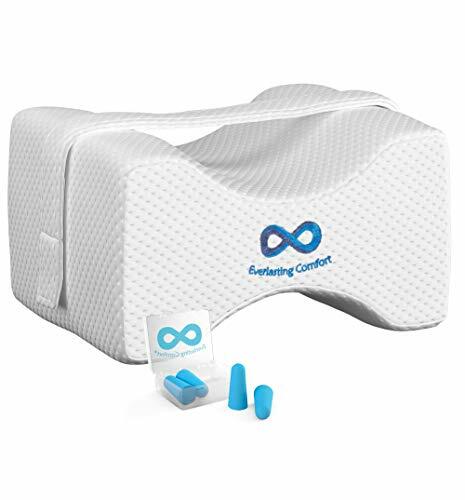 An adjustable and removable strap ensures the knee pillow stays in perfect alignment when sleeping even if tossing and turning. Hook-and-loop strap keeps pillow in place. Relief and treatment for knee bursitis pain. Pillow is too thick for customers with narrower legs. Memory foam can flatten over time and offer less support. More severe cases of knee bursitis may be too painful to apply compression to when first starting treatment. This large flexible ice gel pack is ideal for targeting the specific bursa with soothing cold treatment. A soft fabric cover keeps the skin comfortable and dry from condensation. It’s a lot easier than messing about trying to balance towels and bags of crushed ice. The pliable clay compound absorbs cold temperatures when frozen for at least four hours and slowly releases at a stable temperature for up to 30 minutes—more than enough for the recommended 20 minutes treatment. Flexible clay pack even when frozen. Soft fabric prevents ice contact with skin. Large enough to wrap around larger knees. Stays cold for up to 30 minutes. Can be heavy when folded for storage in freezer. Using a knee brace or compression sleeve is a great way of reducing the swelling of knee bursitis and easing the pain of movement. 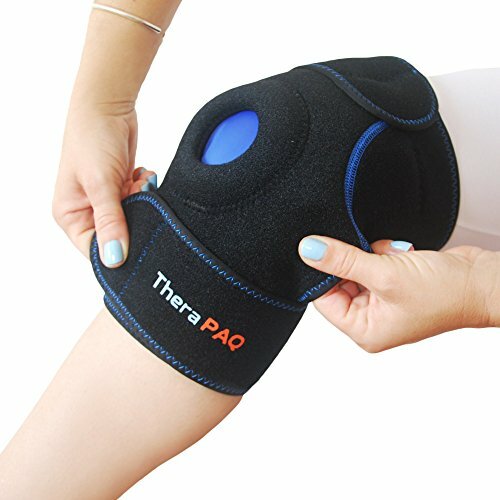 The knee support helps with mobility by increasing blood circulation, regulating temperature and delivering more oxygen to the injured area. A lightweight brace, the fabric is moisture wicking and odor absorbing for long-wearing comfort. You could even wear this under your clothing very easily. Using this Incredibrace will help reduce swelling of injuries to the bursa sac. Geranium/bamboo/charcoal blend fabric is moisture wicking and odor absorbing. Increases blood circulation which can help reduce swelling and inflammation. Stabilizers at side of sleeve can be uncomfortable and may aggravate knee pain. People with larger thighs may find compression around knee is too loose. Our final product for the best treatment of knee bursitis is a turmeric supplement which promotes anti-inflammatory activity. 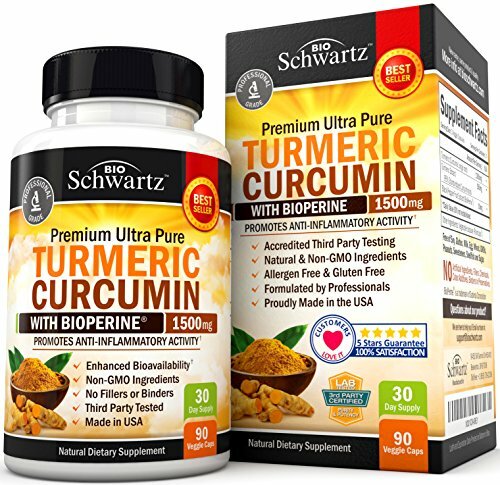 This formula from well-known U.S. brand Schwartz combines the highest potency of turmeric curcumin with black pepper (bioperine) for the most effective absorption. This turmeric extract has been formulated by doctors and produced in an FDA-approved facility to assure the highest quality and purity of each batch. Used as an anti-inflammatory for joint pain and arthritis, taking the recommended three capsules a day can help reduce the swelling of the knee bursa and comfort the pain. Bioperine increases the absorption and bioavailability by 2000 percent. with just turmeric and black pepper. More expensive than other turmeric capsules. Weird aftertaste may cause nausea. Knee bursitis will make it difficult to get through each day, with knee pain and limited movement. But it’s treatable and a quick diagnosis can be key to reducing the severity of the condition. A healthcare professional will be able to advise you of the best treatment for knee bursitis for you. The main aim of knee bursitis treatment is to reduce the symptoms of swelling and pain. The Knee Ice Pack Wrap by TheraPAQ offers a combination of compression and hot/cold treatment which have been proven to reduce inflammation. In our opinion, the pain relief offered by this knee ice pack makes it the best treatment for knee bursitis you can buy over the counter. 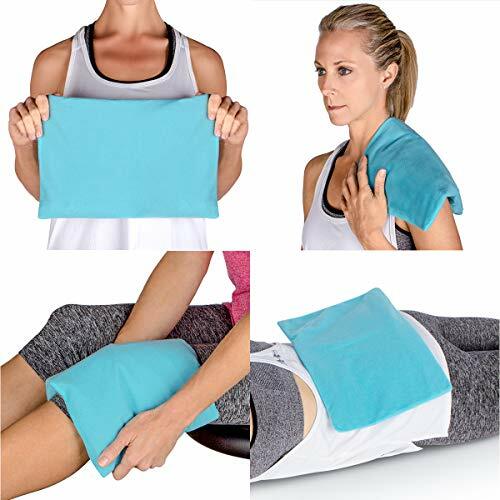 What is the Best Ice Pack for Knee Pain in 2019?